This is achojcha. You can also use zucchini or okra. Salt and black pepper, as needed. Cut the caigua in halves, extracting all seeds and discarding them. Add them to boiling water and let cook for about 3 minutes. To prepare the dressing: Put the onion in a saucepan with oil, add salt, black pepper, garlic, tomatoes and sweet pepper, and let cook. To prepare the filling: Put the chicken breast in the food processor to get a thick paste, later add the carrots to this, as well as some teaspoons from the dressing above named. Fill the caigua with this. Put in a large casserole with the remaining dressing and bake for around 1/2 hour. If the dressing evaporates before the okra are cooked, add a little water. This is to be served hot, accompanied by rice only. Meat can be used instead of chicken, in some vegetarian versions, both ingredients are overlooked and potatoes and boiled eggs are used as substitutes. 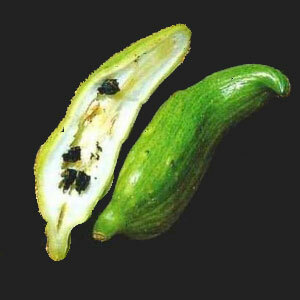 Note: Achojcha is an Andean veggie, popular in Bolivia and Perù, whose flavour is similar to zucchini. Its scientific name is Cyclanthera pedata.